Originally published: February 8, 2017. Over and over I see videos and read articles raving about 550 paracord and the need for it in your pack. Yes, you absolutely need cordage in your camping gear and bug out bag, but is paracord the best option? 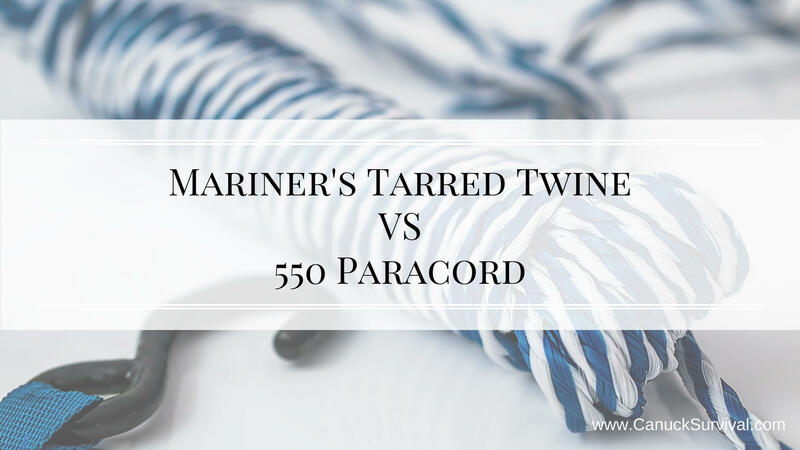 Let’s look at Mariner’s Tarred Twine VS 550 Paracord and discover which may be best for you. First introduced to mariner’s tarred twine in Bushcraft 101 by Dave Canterbury. He mentions he finds it to be superior to any other cordage available. Let’s dive in and look at the difference between mariner’s tarred twine and 550 paracord. Below will focus on the materials used, weight, strength, versatility, and of course the price. Also known at bank line, mariner’s twine is made out of three synthetic materials woven together. The twine is then tar coated keeping it UV protected, waterproof, easy-to-tie, and holds knots well. This twine is thin and able to be broken down into the three separate strands with no issues. Also known as parachute cord or type III cord, it consists of seven to nine inner nylon yarns twisted into three strands. These strands are covered with a braided sheath of nylon. You can cut off the sheath and unwind the strands to extend the length of the rope, however the ends may fray and you’ll need to melt the ends with a lighter so they don’t come completely undone. Very lightweight! A 1 lb. roll of #12 twine is approximately 1,890 feet; 1 lb. of #36 twine is approximately 541 feet! Numbers vary depending on manufacturer. Because paracord can range in the number of strands and thickness, generally a 1 lb. roll will be roughly 100 feet of cord. The mariner’s twine comes in many “numbers”. Twine #12 and #36 being the most popular. #12 has a breaking strength of 100 Lb. while #36 has a 320 Lb. breaking strength. # 6 3970 Ft. 50 Lbs. .031"
# 9 2268 Ft. 80 Lbs. .042"
# 12 1890 Ft. 100 Lbs. .046"
# 15 1563 Ft. 125 Lbs. .051"
# 18 1167 Ft. 165 Lbs. .058"
# 21 915 Ft. 200 Lbs 0.65"
# 24 750 Ft. 240 Lbs. .073"
# 30 635 Ft. 280 Lbs. .078"
# 36 541 Ft. 320 Lbs .085"
# 42 485 Ft. 360 Lbs. .093"
# 48 399 Ft. 440 Lbs. .103"
# 60 318 Ft. 560 Lbs. .116"
# 72 265 Ft. 640 Lbs. .125"
# 96 180 Ft. 920 Lbs. .158"
# 120 161 Ft. 1120 Lbs. .170"
As the name suggests, 550 cord has a breaking strength of 550 lbs. Can be used for anything that paracord can aside from repelling. A user on Bushcraft USA went to the Amazon ignoring the recommend mariner’s twine, only to find that everyone used it. He found that the mariner’s twine/bank line provided smaller knots and held much better than the paracord. Depending on the strength and application will determine the twine size you require. For example, #12 twine will be great for making fish nets while #36 is best suited for shelter tie-downs. A very versatile cord with it’s most popular use being shelter creation amongst the campers and bushcrafters. That said, there are a million uses for paracord that aren’t possible to cover here. Cheap! The #12 and #36 mentioned above can be bought at Dave Canterbury’s online store for only $12.95 USD. That’s a hell of a lot of cordage for 13 bucks. A little pricier, and you have to be careful of Chinese knockoffs online, generally a 100′ roll will be about $10-$15. Check the prices on Amazon now. Thin, lightweight, very budget friendly. The mariner’s twine is strong and the tar coating allows for UV protection, waterproofing, easy to tie and strong holding knots. Stronger than mariner’s twine and perhaps more versatile, but the 550 will fray when broken down to smaller strands, and each cut will require you to melt the end. There is no UV or water protection so not great for extended outdoor use. Mariner’s Line takes the cake. Because it’s thin and lightweight you’ll be able to pack more of this twine into your pack. Thanks to the low price it won’t hurt your wallet either. The added protection the rope receives from the tar coating to block UV rays and water is a huge bonus. Also, thanks to the tar the knots will hold much better than the paracord. Overall, it won’t hurt to have both in your bag. Carry 20-50′ of paracord and as much mariner’s twine as you can for a more versatile pack. What’s your favourite cordage? Leave a comment below and thank you for reading! I visited this page to try and fin out what the numbers indicated for the tarred twine (#12, #60, etc.). Did not find all that I wanted but still gained some knowledge and will be buying some tarred twine! Any canadian places to buy bank line online? or will I need to go to my local fishing store? I haven’t been able to find other Canadian sites other than Amazon and Bass Pro Shops.